Jeremiah accurately prophesied that after 70 years were complete for Babylon, the Jews would be permitted to return to Jerusalem and rebuild the city and the Temple. 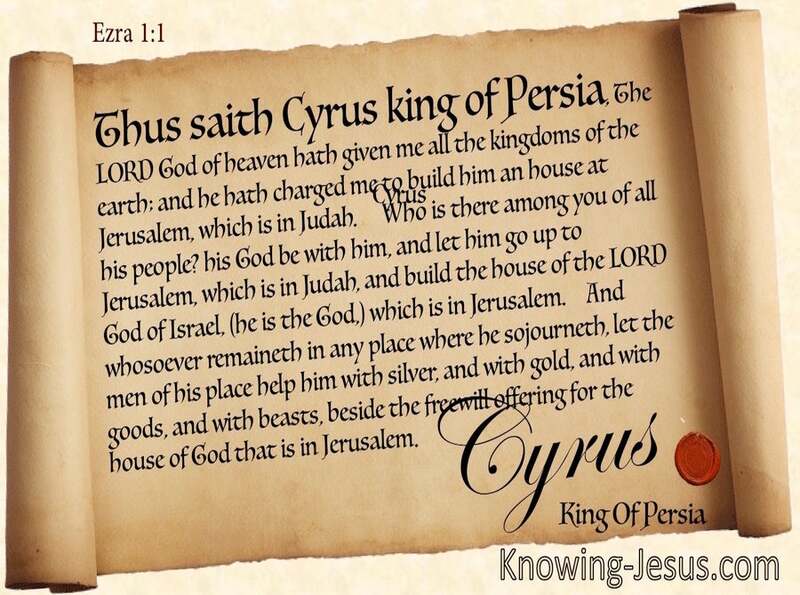 After Media/Persia conquered Babylon, King Cyrus of Persia issued a decree allowing the Jewish people to return to Jerusalem to rebuild the city and the Temple. Cyrus allowed the exiles to return to Judah and build a temple for God in Jerusalem by issuing a decree. Nearly 50,000 Jews traveled from Babylon to Jerusalem (Ezra 2:64). They brought with them silver and gold, as well as other important articles from Solomon’s Temple that were looted by Nebuchadnezzar.These were entrusted to the care of Sheshbazzar (Zerubbabel) and were carried to Jerusalem. Rebuilding the Temple was not an easy task. The construction work stopped because of strong opposition from the locals, and it was not until Darius I became king of the Persian empire when the rebuilding of the temple resumed. As prophesied by Daniel, the rebuilding of the Temple did indeed occur during “troublous times” as the neighbors of the Jewish people did NOT want them in Jerusalem and DID NOT want them rebuilding the Temple. Ezra 4:4 Then the people of the land discouraged the people of Judah, and frightened them from building, 5 and hired counselors against them to frustrate their counsel all the days of Cyrus king of Persia, even until the reign of Darius king of Persia. It’s really no different today. Israel’s neighbors do NOT want them in Jerusalem, and they do NOT want them even considering rebuilding the Temple a 3rd time. Even today, we have heard the chants “Drive Israel into the sea” from some of their hostile neighbors. The 2nd temple was finished under Governor Zerubbabel and blessed in 516 BC with a lavish celebration; however, the Israelites continued to face threats from their neighbors because the walls of Jerusalem remained in ruin. During the reign of King Arterxerxes of Persia, a Jewish man named Nehemiah was serving as the king’s “cup-bearer” in Susa (Capital of Persia). Nehemiah heard from some friends in Judah, who had escaped captivity, that the Jews were having great difficulty rebuilding and defending Jerusalem because of the hostility of their neighbors. Nehemiah wept, fasted, and prayed to YHWH acknowledging the sins of all Israel (the Jewish people), asking the Lord to grant him favor in the eyes of Persia’s King Artaxerxes. Nehemiah was about to go before the King to request assistance for his people in Jerusalem. Nehemiah understood that an unwalled city, surrounded by hostile neighbors, was a city in danger. The destruction of Jerusalem’s walls left its people exposed to great trouble and shame. Although the 2nd Temple had been completed, Nehemiah wanted to rebuild the walls of Jerusalem to ensure the safety of the people and the Temple. The walls would provide protection and dignity to a people who had suffered the judgment of God but had later been restored and returned to the Promised Land. Nehemiah did indeed receive favor with King Arterxerxes, who subsequently issued a decree to assist the Jewish people that were living in Jerusalem. Most Biblical Scholars agree that this decree was THE DECREE referred to in Daniel 9:25 which started the Prophetic Clock to the Messiah and ultimately the Kingdom of God on earth! Daniel 9:25: Know therefore and discern, that from the going forth of the commandment to restore and to build Jerusalem unto the anointed one, the prince, shall be seven weeks, and threescore and two weeks: it shall be built again, with street and moat, even in troublous times. The books of Ezra and Nehemiah detail the rebuilding of the Temple, the walls of Jerusalem, and the gates under Zerubbabel, the Governor of Judea. Many Jewish people were disappointed in the second Temple because it didn’t even begin to compare with the splendor of Solomon’s Temple. The 2nd Temple was built on a much smaller scale with fewer resources. Also, Solomon’s temple had housed the Ark of the Covenant, which was no longer in Israel’s possession. And at the first temple’s dedication, the altar had been lit by fire from heaven, and the temple had been filled with YHWH’s Shekinah Glory. Attendees at the second temple’s dedication witnessed no such miracles. Even so, Haggai prophesied that the second temple would one day have a magnificence to outshine the glory of the first (Haggai 2:3–9). Haggai’s word was fulfilled 500 years later when Jesus Christ arrived on the scene (Luke 2:22, 46; 19:45). Zerubbabel’s temple was not as outwardly impressive as Solomon’s, but it had a greater glory: the Messiah Himself walked the courts of the temple that Zerubbabel built. In these last days, patterns continue to repeat as the Prime Minister of Israel, Benjamin Netanyahu, compares President Donald Trump to King Cyrus in “complement of Biblical proportions”. March 6, 2019. 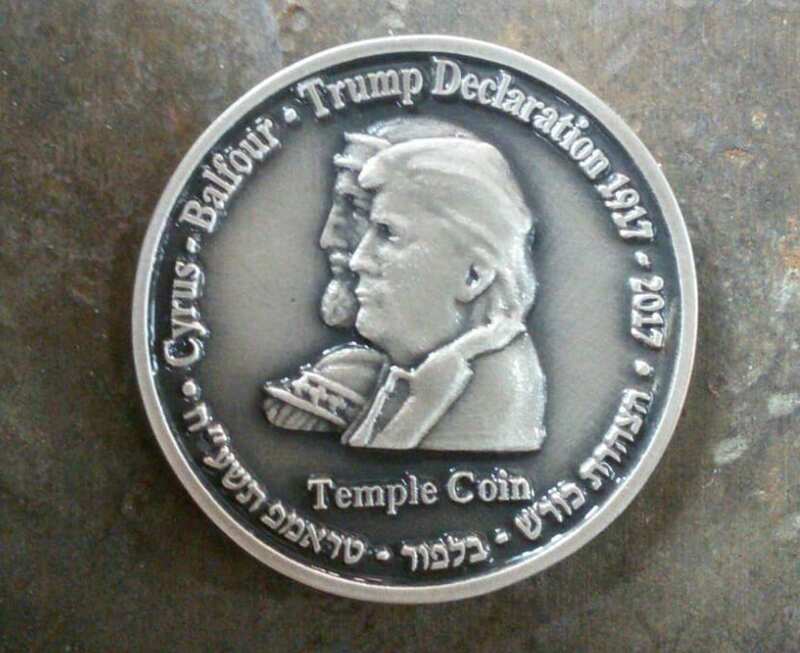 Most recently, the Sanhedrin emphasized the apparent connections between both leaders by issuing an silver medallion with the image of Trump superimposed on an image of Cyrus with an image of the Jewish Temple on the flip side of the coin.